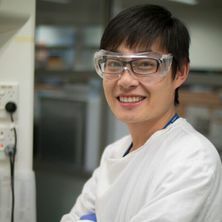 Dr Cheng Zhang is working on the synthesis and characterisation of biomaterials, in particular, polymeric imaging agents. His research strengths are in molecular level characterization by means of magnetic resonance and computational techniques. In the field of molecular imaging, in particular the 19F MRI, studies are currently being undertaken on applying highly fluorinated polymers as highly sensitive 19F MR agents for detection of breast cancer. The aim of this project is to develop new magnetic resonance (MR) molecular imaging strategies that will enable the in vivo monitoring of biological processes. Specifically, we will develop novel fluorinated polymers for imaging of early markers of diseases such as melanoma, prostate cancer, malignant glioma and Alzheimer’s disease. Specifically, the project involves the synthesis of new partly-fluorinated polymers having controlled architecture for the rapidly developing field of 19F MRI. Other imaging modalities, drugs and targeting ligands will be conjugated. The project aims to relate the structure of the macromolecules, determined carefully using advanced techniques such as NMR, light scattering, GPC, AFM and electron microscopy, to the performance as imaging agents. The agents will be tested in small animal (mouse) models of disease already developed by this group and our collaborators. The fast and accurate detection of circulating tumour cells (CTCs) is critical for effective diagnosis and treatment of patients with metastatic diseases. Unfortunately, the development of CTCs detectors is currently hindered by the limited accessibility to materials with precisely defined structure and uniform properties, thus resulting in low accuracy and reliability in detection of CTCs. In this project, we will develop a novel small molecule for the next-generation and non-invasive detection of CTCs with high specificity, sensitivity and accuracy. The application of these polymers to detect in vitro CTCs will be demonstrated and supported by fundamental studies of the properties of these unique molecules. Preparation of Highly Effective and Versatile Discrete Molecular Transporters for the Delivery of Drugs and Probes. The design and development of new agents that enable or enhance the passage of drugs and probes across biological barriers is a goal of unsurpassed significance in the search for improved imaging molecules, diagnostics and therapies. However, the development of highly-effective molecular transporters is hindered by current synthetic strategies. As such, it is critical to be able to prepare novel monodisperse molecular transporters (Ð=1) with precise structures, compositions, and function, which are essential for their special and unique transport properties. In this project, a versatile and scalable strategy for the preparation of discrete (monodisperse) materials will be developed. This approach enables the combination of facile polymerization procedures and ubiquitous purification processes. Different types of well-defined oligomers with different charges will be synthesized and their interaction and internalization with cells will be further demonstrated. Zhang, Cheng and Ferenz, Katja (2018) Nano-bio-imaging and therapeutic nanoparticles. Journal of Nanoscience and Nanomedicine, 2 1: 19. Hou, Lijie, Zhang, Cheng, Li, Yan, Duan, Baorong and Wang, Quanjie (2012) Urea-formaldehyde resin adhesive modified by collagen. China Leather, 23 40: 008. Zhang, Cheng and Whittaker, Andrew (2017). PFPE-based polymeric 19F MRI agents: a new class of contrast agents with outstanding sensitivity. In: 253rd ACS National Meeting & Exposition, San Francisco, CA, United States, (). 2-6 April 2017. Zhang, Cheng , Moonshi, Shehzahdi Shebbrin , Peng, Hui , Puttick, Simon , Reid, James , Bernardi, Stefano , Searles, Debra J. and Whittaker, Andrew (2016). Ion-responsive 19F MRI Contrast Agents for the Detection of Cancer Cells. In: 7th International Nanomedicine Conference, Sydney, NSW, Australia, (). 27-29 June 2016. Zhang, Cheng , Reid, James , Bernardi, Stefano , Bernhardt, Debra , Peng, Hui and Whittaker, Andrew (2015). The Conformation of Hydrophobically-Modified Thermo-responsive Polymers of Poly (OEGMA-co-TFEA). In: 35th Australasian Polymer Symposium, Gold Coast, QLD, Australia, (). 12-15 July 2015.